Agritex Energy S.A. is the leading hydroponic greenhouse tomato producer and supplier in Greece who operates more than 10 hectares of glasshouse growing area. 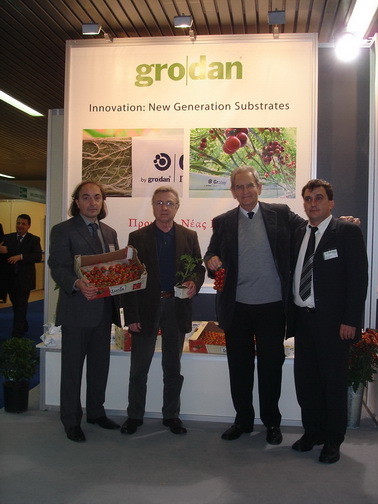 Agritex grows and markets high quality glasshouse grown cluster tomatoes under the brand name “Lucia”. The co-operation between these two highly innovative companies, Agritex and DKG will extend over many horticultural disciplines and technologies, for example Climate, Energy, Water, Fertigation plus aspects of Labour/Production Management systems, Problem Solving, Crisis management and Team building. The co-operation is valid from last September and covers the 2008-2009 crop season. Cutting-edge glasshouse construction technology and operating systems sourced from the world’s leading suppliers is incorporated into Agritex’s € 22 million state-of-the-art truss tomato facility in Greece. Agritex’ general manager Vasily Haitas said the 10 hectare facility at Alexandria, Macedonia, Greece, is one of the two largest glasshouses built in one stage in Greece. The project is a collaboration between leading glasshouse constructor DALSEM Group, agribusiness investor “REDESTOS”-Efthymiadis Agrotechnology Group and Construction company ARXITEX. The environmentally controlled facility incorporates the most technologically advanced glasshouse techniques in the world, with water efficient irrigation, innovative pre-packing and a co-generation plant to ensure the glasshouse is operating in an environmentally friendly manner. The co-generation is run on natural gas to create electricity, heat and carbon dioxide. The heat and CO2 go back to the glasshouse and the excess electricity is sold to the national grid. The closed watering system collects the water and treats it for diseases before being channelled back into the crop which is hydroponically grown on Grodan rockwool substrates. The glasshouse is been designed to maximise light by creating a roof span with minimum shading. The structural supports are been from steel; the glazing bars made of aluminium and the gutters collect and re-channel water to the storage system. The facility, estimated to produce 5,000 – 6,000 tonnes of truss tomatoes a year. Agritex’s technical people have to make sure that, not only does all tomato fruits on the vine ripen within five to seven days, but also have excellent taste characteristics. The project has created 60 local jobs for irrigation specialists, crop workers, pack-house, quality assurance, human resources, and administration employees. While glasshouse construction is initially more expensive than open-field production, growing tomatoes in a glasshouse environment is more energy efficient in the long term, and particularly effective in conserving water. Hellenic Farming S.A. markets the produce (Lucia truss tomatoes) to supermarkets, independent retailers and aligned market wholesalers throughout Greece. Photo: (from left to right) - Christos D. Katsanos (DKG), Mr. Georgios Georgiadis (Managing Director Agritex - Arxitex), Mr. Nikolaos Efthymiadis (President Agritex - Redestos, Efthymiadis Group), Evagelos Drimtzias (Grodan Account Executive).